If you've been working "on" your business for any period of time, then you'll really enjoy our next SMB Conference Call. Our guest is technical business coach George Sierchio, author of BYOB: Build Your Own Business, Don't Be Your Own Boss. In addition to the general topic of freeing yourself from your business, we'll talk about what George calls your "Self-Imposed Glass Ceiling." We're going to talk about the limitations to your success -- and the role you play in building and keeping those limitations in place. Scary stuff. But remember: growth takes place when you acknowledge your areas of weakness and address them. George is one of the featured speakers at SMB Nation, later this week. If you're going to Seattle, be sure to connect with George. If you can't make it, be sure to catch this call. Also, drop by Booth 100 as George will hang out there from time to time. Join us on Wednesday, Oct. 1 at 9:00 AM. Details are listed on the SMB Conference Call Page. We heard some great news Friday from our Friends at Results Software. Results CRM has won the prestigious "2009 QuickBooks Awesome Add-on" award! Congratulations to Naseem, George, Michael, and the whole crowd. Looks like we'll have to make room for a shiny award at Booth 100 at SMB Nation! The 2009 QuickBooks Awesome Add-on Award has been given to only 7 products of over 300 QuickBooks add-ons, that are now a part of the Intuit Developer Network. Results Software is the only one awarded to a CRM and Business Management software. The product shows superior design, implementation, and features. The product has superior integration with QuickBooks. It passes data to and from QuickBooks using best practices of the QuickBooks SDK programming interface. The product uses appropriate transaction types and field population for recording data into QuickBooks so as to preserve and/or enhance the standard reporting features in QuickBooks. The product conforms to good accounting and operating practices. Results company has shown outstanding customer support. They provide the highest level of support to both end users and consultants. This area is a key element to the overall satisfaction of an add-on product. The Sleeter Group also noted that Results CRM, and the company behind the product, are unique in providing products and services that are focused at both the VAR and the end-user. Results doesn't just provide a product for clients and give you a piece of the pie: They help you grow your business and provide better solutions so you can make more money. Great Little Book is proud to be a Results CRM user, sales partner, and reseller. Congratulations to Naseem and the gang! Great job! Only 6 days left to register for "Absolute Best Practices" with Erick Simpson and Karl Palachuk! Whether you're new to SMB Consulting, or an old hand, you'll learn a lot of great new stuff from these two authors and successful SMB Consultants. No matter where you are in the process, you'll find valuable best practice tips in this four hour seminar. From managing client relationships to hiring employees, from sales and marketing to running a service board. We'll cover it all. Have you ever noticed that, in anything you do, there are only a handful of key rules that account for the vast majority of your success? In this seminar, two successful consultants - who have each sold millions of dollars in services -- will give you the nuggets you need to move your SMB Consulting practice to the next level. Every person who registers for this event will receive two FREE audio books! Each attendee of this seminar that signs up as a new business member or renewal of business member of SMBTN will receive a credit of $50 toward any purchase at SMB Books. Only 7 days left! Register today! How do people want to buy services? All together now . . . for a flat monthly fee! Quick Quack Car Wash now provides unlimited car washes per month for a flat fee. Not sure what's below "good." I'd personally rather have a good car wash than one that's not good enough to be called good. And how about you? Are you still trading dollars for hours? Every once in awhile I find myself kicking myself because I forgot something. For months now I have been meaning to write about http://www.varvid.com/, Aaron Booker's great video blog. In addition to being educational, Aaron's video blog is fun. Just look at the snaps. Aaron is smiling in every single one of them. Of course that's just Aaron, too. Without spilling too much secret sauce, let me tell you what Aaron does. He takes good, informative videos from other sources and mixes and matches them with his own. Let me tell you, his own hold up very well to some of the "professional" stuff out there. For example, you'll find DIY stuff from the Wall Street Journal and even Microsoft. Personally, I like Aaron's interviews better. But I realize there's a ton of work in that. Hence my own pitiful record of posting videos. Aaron sets up a background, turns on the camera, and talks to people. And man do people talk! Check out the September videos here: http://www.varvid.com/2008/09/index.html. The only thing I'm not sure about is why old videos disappear. Perhaps Aaron can comment on that. The archives primarily focus on non-Aaron videos. And Aaron must enjoy this because he just launched another video blog site over at http://www.socialpastures.com/. Social Pastures focuses on Social Media. They're nicely agnostic about FaceBook vs. LinkedIn, etc. Right now he's got some good stuff from a recent Social Media conference, including interviews with people who made it happen. As you'll learn, Aaron is refocusing his business to provide web content for clients as well as the network support most of do. That's a nice growth industry, and this is a good time to get in. Sorry, Aaron, for taking so long to post about your cool projects. Now if you could just point us to the interviews you did at WPC . . .
My good friend Vlad constantly rails against the incompetence and unprofessionalism of "SPFs" (single points of failure). It is certainly not the case that all Sole Proprietors in the technology field are incompetent or unprofessional, but there are days when I just can't believe how horribly incompetent some of them are! About once a year we step into a snake pit that one of these losers left in his wake. - He sold the wrong equipment to the client. - He "sold" them illegal, outdated, pirated, or gray market software. - He couldn't figure out how to configure the hardware. - He couldn't install SBS 2003!!!!!!!!!!!!!!!!!!!!!!!!! - He didn't configure the firewall, the network, the desktops, or anything else correctly. The worst part is: We bid on this job. The prospect became loser-boy's client. Loser-boy trashed their system and charged them full price. Only THEN did the prospect become our client. Wow. Think of all the money they could have saved. That means the client made a conscious decision to choose loser-boy over us. They chose inferior hardware and pirated software, delivered by a dishonest scoundrel. Well, maybe they didn't choose that. But . . . they didn't choose top notch hardware with real legal software delivered by competent technicians. If a client simply goes with price, are they responsible for the results? Yes. At least in part. On one hand, if the price from one technician is significantly better than another, it is very likely that competence plays a role the difference. On the other hand, if they assume that a consultant is competent, it's hard to blame them for choosing the lowest priced competent consultant they can find. But how can a client make a true evaluation of the technician's competence without being a technician? A few people have been vocal about raising the bar in our profession. It's overdue. I don't want the government deciding who's competent and who isn't. If you think for two seconds that that's a good idea, check out the tech support in your average state agency. "Microsoft knows this is a problem and they refuse to fix it." Please. Industry leaders (such as Microsoft) can't do it. They will give up professional expertise in a flash if there's a shiny nickel in it for them. Look at the MCSE program. It was very serious in the days of NT 4. But five years ago it had became so diluted that people were getting an MCSE in a weekend. Now their whole certification program is a confusing joke. So what about us (the technical professionals) defining and enforcing some standards on our own? It happens in a lot of other industries. That way, when a prospect is trying to choose a consultant, there is some independent measure of competence and achievement. It doesn't have to measure in fine detail: Just enough so that the client isn't tricked into thinking that an incompetent technician is really competent. Let me be very honest. There are some good programs out there. Microsoft, Cisco, and a few others have some very good measures of competence. For example, with MS Certified partners, there are some real barriers to entry. They don't guarantee that incompetent scoundrels won't get become certified, but they make it a little more difficult every year. Microsoft also performs client interviews and satisfaction surveys for Certified Partners. But even with these few things, there are no good tools for clients to find competent technicians. Or for clients to vet the technicians who show up on their doorstep. 360 days out of the year we have a story about the last big loser. But 5 days a year we live through a lot of frustration, cleaning up after the loser and apologizing to the client for being part of an industry that is less regulated than used car salesmen. Most importantly, we spend five days trying to convince the client that we're not all dishonest and incompetent. Help me out here. It's one thing to complain. How do we take concrete steps to take our profession to the next level? We announced in July that We will not reprint the Network Documentation Workbook. Unfortunately, I've been inundated with requests since then. "I want just one copy." "I bet you have ONE lying around the office." "I'm a new consultant and I've been told that I need this book." Now they're even bugging HarryB because he originally sold the Network Documentatin Workbook on the SMB Nation web site. So, while I think the The Network Documentation Workbook needs revision, we're giving it a reprieve of sorts. - The book in .pdf format 8.5" x 11"
The e-workbook is now delivered totally electronically. So there's no waiting and no postage. Thank you, again, to everyone who made this book such a tremedous success. I am honored by your support. I promise there will be a great revision some day. But for now, this will have to do. I subscribe to a lot of stuff. One of the best things I subscribe to is Perry Marshall's newsletter. He's one of those folks that provides inspiration on one hand and a long to-do list on the other. Today, for no good reason, I received the email reprinted below (with permission). The text in bold is my emphasis to highlight the most important piece of this. If I could double-bold one line, it would be this: "The email your customers get from you may be the only positive, encouraging email they get from anybody all day." On Monday and today, the stock market took some major hits. But on both days there were stocks reaching all-time highs. Remember, the difference between average and spectacular is extremely small. Don't join the doom-and-gloomers. Be the person you want to spend time with! This morning I had breakfast with a friend. We had important stuff we needed to talk about today. There was a TV above and a few feet behind him, a constant stream of b-a-a-a-d news (the Fed has to bail out AIG, financial institutions are collapsing, yada yada) and I had to get up and walk over and turn the volume down just so we could have a conversation. That, my friend, is a snapshot of what all of us have to fight every day. Gloom. Doom. Negativity. Bad news. Failures. Collapses. Economic woes. Uncertainty. Drowning out conversations that really matter. The world is awash in this dreariness. Oh yeah, and glib promises by professional politicians: "Vote for me and I'll fix it for you." You will accomplish NOTHING positive by focusing on ANY of this. It will only weaken and distract you. Nor will it help you to dwell on the problems that are going on in your particular industry. That only reinforces the status quo. If you've followed me for any length of time, you know I have a cynical streak. I look at the world through a jaundiced eye. I've been a mark on more than one occasion and I've always got my radar on for the con man. I'm able to detect the fly in the ointment. Being that way, I have to give my head a shake as much as anyone. I easily get sucked into the vortex of badness - just ask my wife. Or ask Bryan. They know. I have to always remind myself that wherever there is chaos and uncertainty, there IS opportunity. And... yes there may be things to criticize but there are also things to be praised. There is much around us that is GOOD and praiseworthy. Nobody's going to be inspired to focus on the good stuff if they're just watching the news. More than likely, if there's anything good to be said, it's going to have to be said by YOU. If your employees or partners are going to hear an encouraging word from anyone today, they'll probably have to hear it from YOU. The email your customers get from you may be the only positive, encouraging email they get from anybody all day. As such it will stand out. Light and dark cannot occupy the same space at the same time. I'm at a Strategic Coach meeting today, where Lee Brower said, "Grateful kids do not commit suicide. Grateful husbands and wives do not get divorced." Thanks for that reminder, Mr. Brower. Before you're done reading this email, I'd like you to write down 5 things you're thankful for, or accomplishments you're proud of. I would like two of them to be something that's happened in the last 24 hours. Then I'd like you to make one resolution about how you're going to encourage more of the same kind of positive victory to happen - what step you're going to take. Finally: I'd like you to think of ONE thing that's good, that nobody else is recognizing enough, and I want you to communicate it to your customers. Something that gives them hope! So in the spirit of that, I'd like to leave you with something from my own world. The positive thing that I'm seeing is, the stuff that's going on around us is pounding the nonsense out of peoples' marketing efforts. And I am seeing many of my top students experiencing MAJOR successes. One business is tripling this year and has had to break their lease to move to a new space. Bryan and I are seeing record levels of Renaissance Club members, as people who MUST make their marketing dollars work are investing in the education necessary to ensure that they get smart. I'm observing as one guy - who's in the very worst part of the mortgage market - has watched his proud business literally disintegrate during the last year and is courageously taking back ground that he lost, completely reinventing himself and changing the entire way that he interfaces with his customers. Yesterday I got an email from him saying he's been eating, drinking and breathing AdWords all during this past weekend (during the flooding that was going on in Chicago he had little else to do) and the whole thing is starting to scream. He can't wait for the Bobsled Run to start. He will rise from the ashes and will be stronger, nimbler, and have more self respect and confidence. This too shall pass. He knows that and is busy make sure that what comes next is indeed good. My friend, there is opportunity all around us. It just takes a positive lens of expectancy and a KNOWLEDGE that those opportunities exist. May we all have eyes to see them. Reprinted with Permission. For more information, check out www.perrymarshall.com. Earlier this year, Matt Makowicz and I did some seminars on selling and running Perfect Profitable Projects. What makes them perfect? That's easy: You don't lose money! 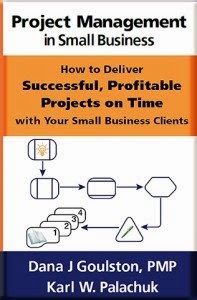 One of the biggest problems with projects in the SMB space is that they tend not to be very profitable. That's partly because the sales people sell the wrong thing, or sell something your company doesn't deliver. And it's partly because technicians are easily hijacked by the client. "As long as you're onsite all day installing a server, I have other work you can do for free . . .."
- Two audio CDs -- one great seminar! The regular price for the live seminar (recorded in 2008) was $399 per person. When these audio programs are sold separately, the cost is $99 each. The early bird price (through October 31st) is only $129.95! Order now at SMB Books. Stuart over at Secure My Company asked me to be on his webinar Thursday September 11th at 9:00 AM Pacific Time. What could I say except YES! Clickety Click Click. Click Click Click. Luckily for me, I've written a book about Service Agreements for SMB Consultants! So, here's your game plan. 1) Read all about the book, but don't buy before Sept. 11, 2008. 2) Register for the webinar (above). 3) Tune in to the webinar on Thursday, Sept. 11th at 9:00 AM Pacific. 4) Listen for the special code that will get you $10 off the book Service Agreements for SMB Consultants (or anything else at SMB Books). That's $10 off the already-discounted price at SMBBooks.com! You will get a ten dollar discount at SMB Books AND ten free 30-day Kaseya licenses to try in your business. How's THAT for Webinar Deal? I can't reveal details yet, but I got an email yesterday that makes clear how much the world of SMB Consulting is changing in the next year. We are truly entering the stage of SMB Consulting 3.0. - Reports to clients can be rich and useful. Range from one-page summaries to dozens of pages per month. - Flat fee pricing is becoming the norm, filled in by hourly project labor. - Specific work outsourced to NOC (MSPSN, Zenith, etc.). - First level of growth comes from assigning more and more work to NOC, allowing smaller MSP to take on more clients. - Second level of growth includes hiring staff, knowing that you have the NOC behind them. - Third level of growth comes from bidding on much larger jobs because you have automated support and capacity-on-demand. - Monitoring, managing, and maintaining systems is the core requirement. Break/fix is much reduced. - Communities are flourishing. SMBTN, MSPSN, HTG, MSPU, SBS user groups, Yahoo Groups, ASCII, Comptia, etc. Exploding. Each with a unique contribution to the mix. But now I've seen the future. - Books and products you didn't see coming. Great stuff. Prices are NOT in the $599 / $999 range. More like $150, $100, even $60. - Alliances between organizations that give preferred pricing and benefits will continue to evolve. - One of the current first-tier conferences will eclipse SMB Nation within six months of today. - Deeper channel involvement with the SMB consultant community will mean faster tech support, better free training, and deeper discounts. - Group involvement in purchasing power for next-generation technology will put participants way ahead of those who do not participate. I know these are vague, but very specific announcements are planned soon. Add all that to the amazing, over-the-top training and best practices from MSPU and the awesome growing communities at MSPSN and SMBTN, and the future is HERE! SMB Consulting 3.0 is still evolving. Many businesses (all sizes) have not moved to 2.0 yet. And what will be so next-generation in the next year? - Client requirements for managed services. - True professionalism of organizations. Again, standardized roles, training, certifications that aren't from vendors. - Dramatic reduction in tool prices. Perhaps even consolidation of the industry. - A clear change of who the most important players are in the space. In conferences, in training, in tools, and in online resources. What a great, exciting time to be in the business. These changes are taking place at three levels: The clients, the MSPs (VARs), and the support communities for the VARs. The support communities have really matured. We might last another 15 months before consolidation begins, but I don't think so. There are too many spectacular organizations, and they all want to provide everything. The VARs or MSPs are embracing the tools. Anyone who is completely break/fix on January 1, 2009 had better start polishing the resume. You don't have to call it managed service and you don't have to offer flat-fee pricing. But you better have a ticketing system (e.g., Autotask), a delivery system (e.g., Zenith or Kaseya), and a back-end NOC arrangement (e.g., MSPSN or Zenith). Part of the consolidation is going to come from the fact that you can now buy world-class tools on a one-by-one basis (e.g., Secure my Company or MSPSN). So the smallest VAR has no excuses not to participate. The Biggest Change that's coming is Client Sophistication. If you haven't already run up against it, you will start finding clients who expect remote monitoring, patch management, regular reporting, flat fee pricing, remote desktop support, monthly maintenance, and vendor management. Think about it: If you are buying a firewall or a laptop, what do you do? You make a little checklist and compare three or four options. - VPN built in or extra cost? - Spam filtering built in? - Virus scanning built in? Your prospect is looking for a new service provider to manage their network. The last one was a mid-sized VAR with 20 technicians who promised managed service but really only did remote monitoring and remote desktop support. They had a ticketing system but zero understanding of true managed services. The tools do not make the consultant. -- Reporting - how much and when? -- Ticketing system with the following features . . .
-- Outsourced CIO: included or extra fee? -- Includes Spam Filtering service? -- Offers Hardware as a Service? How many of those boxes can you check? The first ever MSP Revolution is over. Your new Glorious Exalted Leader is Amy Luby, with her Minions for Life, Chad and Steve. The Revolution began after SMB Nation 2005. The September Revolution was led by Amy Luby and Chad Gross, then of MobiTech. By 2006 They had gathered a following of disgruntled workers who were unhappy trading dollars for hours. They saw that the current VAR structure couldn't last. They saw that a few were doing well, while the masses were starved for information on running a successful service practice. Amy created and managed the Managed Services Yahoo Group. The Revolution gathered followers very quickly. After years of blood, sweat, toil, and tears, the MSP Revolution event was announced. Followers gathered in Chicago with promises that this would not be just another gathering of nerds. By all accounts, the Pre-Day Events were good, and certainly above the category of "entry-level" content. But on the first full day of the conference, the Revolution was declared a success. The old regime of same-old-same-old conferences was vanquished. The only question was: Would Amy assume the leadership role or leave a vacuum to be filled? On Saturday and Sunday it was clear that Amy Luby, Spiritual Leader of the Revolution, would be declared dictator for life. The first-ever MSP revolution was fresh. It was inspiring. It was a great combination of new content, new speakers, and some of the best familiar faces in the industry. And here's the key to this revolution: They did not present the 100,000th discussion about why you need to do managed services. Or why you need to market. Or why you need a service agreement. The assumption was that everyone knew about each of these, and all presentations were designed to take the attendees to the next level. Think about a different analogy: The community of MSP-focused events has been offering 101 and 102 classes for almost three years. Now the first class of 80 people has completed the first-ever 200-level classes. And they snuck in one intensive senior-course. Of course they snuck it into a eight-hour time slot. For the first time ever, long-time attendees of the various conferences had the same eager enthusiasm when they left as people have with their first-ever conference. A handful of people (The most obvious example is Erick Simpson/MSPU) have been delivering higher-end content to individuals and organizations. Now, someone finally figured out how to deliver the next level of content for Managed Service Providers in a conference format. Now we pray that Amy will continue to be a benevolent dictator. Congratulations to Amy, Chad, Steve, Nancy, and everyone who contributed to this event. You've really done something good here. Hats off. Kudos. Deep and Humble Bows. Amy Luby and MSP Revolution have created an event that is truly powerful, new, different, and amazing. Sound like too much superlative? It's not. Yesterday Amy and MSPSN presented one of the greatest events I've every experienced in the SMB space at any conference. It really, honestly took content to a new level. As you may know, I attend several events over the course of a year. I've seen the conferences and dog-and-pony shows for years. I've presented a few myself, from Prague to Seattle and a lotta places in between. So after awhile you begin to wonder when you'll see something new and refreshing. Jeff Middleton did it two years ago by introducing a new conference format at SBS Migration. SMBTN did it this year with a long conference format this Spring. But even though those events were spectacular, they both grew out of a format with a context that is familiar to all of us. What Amy and MSPSN did Friday was outside the context of anything that's been done before in the SMB space. Amy worked with Andromeda Training, Inc. (www.income-outcome.com) to develop an eight-hour business simulation game that teaches business owners and managers how to understand the flow of money into, inside, and out of their organizations. The game was very "mature" in the sense that it was very thoroughly developed and the content was completely customized for the SMB VAR and Managed Service Provider. It is very clear that many, many hours went into training the instructors about how the technology business and sales process works. Like many people I talked to, I was dreading the day a little before it started. Role playing isn't my thing. I had visions of practicing sales speeches on each other. Instead, I found myself in the middle of a fantastic, engaging game somewhere between Risk and Monopoly, built entirely around financial education for the SMB Consultant. While competing in teams of 6-7 people, we learned about cash flow, balance sheets, and the moving of assets. Sounds boring, but it wasn't. People were spying on each other, scheming, speculating, and even gambling on different strategies. Each "round" of play represented a calendar month. In that month, resources could do specific work: sales, admin, tech support. You could buy licenses to provide managed services. You could bid on jobs with recurring revenue, break/fix work, or some combination of these. In order to succeed, teams needed to take risks, allocate resources effectively, make sales, deliver work (monitoring and break/fix), pay the bills, expand capacity, and not waste money. The game was surprisingly elaborate and 100% engaging. More than 70 people played, and no one was bored. At the end, participants had a much clearer understanding of how finances work within a company. Most of us spend 99.9% of our time in QuickBooks looking at the Profit and Loss report or income statement. We might run a Balance Sheet once a quarter, and that's because the accountant asks us to. This game demonstrated how assets and liabilities move around and are related to each other within the balance sheet. It also showed how actions that look good on the Profit and Loss report can kill your cash flow and therefore you business. I believe every person in the game gained a better understanding of their own finances by playing the game. I know I did, and I've been running balance sheets and P&L's for fifteen years. You've heard many times that the best thing about professional conferences is the interaction with your peers to talk about your business and strategy. This was eight hours of that, wrapped around a great educational game. Amazing job, Amy and MSPSN. So, the preday went well. Day One was over the top. Now I'm ready for Day Two. At 9:00 AM Pacific Time on Wed. September 3rd the SMB Conference Call will be all about Network Migrations. - Zero Downtime is one topic. But not the only. And to be honest, it's only a piece of the puzzle. - From Server 2000 to SBS 2003. Or 2008. - From anything to anything. Well, not quite. Not from a stapler to a Proliant ML 350. But almost! Our guest is Manuel Palachuk, President of KPEnterprises (Sacramento's Premier Microsoft Small Business Specialist). We have developed a massive "universal" migration system. It just happens to feature zero downtime for the client's major systems. Zero downtime for email, SQL, LOBs, logons, etc. We have over 100 people signed up already, and we hope you'll join us. Go to the SMB Conference Call page to register. Please keep 'em short so I can read them while on the air. The Promotion Monkey newsletter -- Monkey Business -- is finally here. The Promotion Monkey Newsletter by itself is worth $40. The audio CD sells for $30. The Relax Focus Succeed® book sells for $20. So, even if you cancel after one month, the Promotion Monkey subscription will easily pay for itself! "If you've got a salable product or service that you can sell online, the Web is a gold mine. 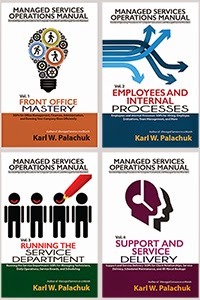 Karl Palachuk's proven, no-nonsense advice will help you get your share of the gold. Subscribing to the newsletter will be like investing in a stock that's guaranteed to pay large dividends." Thank You to everyone who expressed an interest in the Promotion Monkey Newsletter. Please give it a shot. The price isn't very high, and I think you'll find a lot of useful information in it.